The Ibrahim family, (from left) April, Isaac and Magdi Ibrahim, with baby Eliana. Nursing staff on a shift break delivered a baby in their hospital car park after hearing the cries of a woman in labour. Emergency nurses Sasha Ronson and Alix Green, along with nursing student Chloe Doherty and healthcare assistant Dalton Cunliffe, helped deliver the baby on Sunday morning at Blackpool Victoria Hospital. 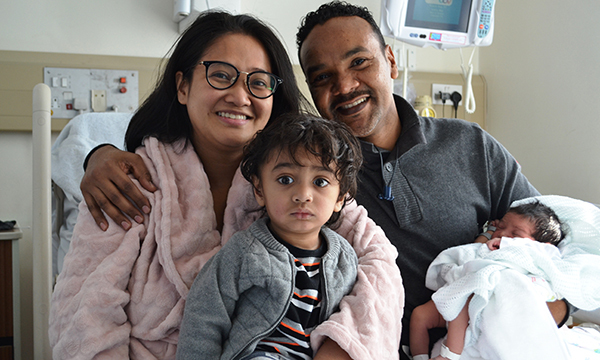 A midwife joined them, after which the new mum and baby Eliana were taken to the maternity unit. 'Dealing with a pregnant woman legs akimbo in a car park is not normally part of my repertoire,' Ms Ronson told the BBC. Parents April and Magdi Ibrahim had already flagged down a passing motorist to get to the hospital. 'I was gripping hold of everybody and knew the baby had to be delivered right here,' Ms Ibrahim said. Her husband, who is a doctor at the hospital, added: 'I was very scared... it was as if all of my medical experience had gone. Blackpool Teaching Hospitals NHS Foundation Trust head of midwifery Nicola Parry said: 'It was great to see how Chloe, Dalton, Sasha and Alix responded so calmly in such circumstances to help deliver the baby safely.